I've remarked in the past that the Android tablet market has been getting awfully crowded, and today i get to show you one result. A new tablet maker has just started shipping, and their choosing a novel way to get attention. AuraSlate is offering a pair of Android 4.0 tablets as tablet development kits, not as retail models.There's a 10" and a 7" model, and they have decent specs for the price. 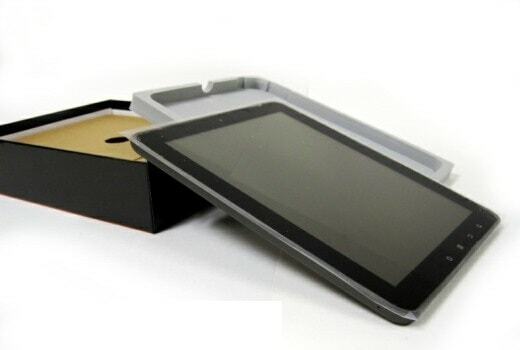 AuraSlate will soon also offer a 9.7" tablet with specs similar to the ones below. The 2 tablets have similar specs. Both re running Android Ice Cream Sandwich on a single core Cortex-9 1GHZ CPU with 400MHz graphics chip. They have Wifi, Bluetooth, 4GB Flash storage, a microSD card slot, and a camera. The touchscreen on both tablets is capacitive, with the 10" tablet having resolution of 1024x768. The resolution on the 7" tablet isn't clearly defined. It's listed as having a 4:3 aspect ratio, and that disagrees with listed resolution of 800x480. The tablets start at $140 and $200. That's pretty good, but part of the reason the prices re so low is that these tablets explicitly do not have a warranty. There are no returns or exchanges, so I wouldn't recommend this tablet to any consumer. But that's perfectly okay, because AuraSlate only wants to sell to device developers, and that's why they're also offering the source code. They're looking for people who want to develop their own firmware for their own tablet. And I expect that AuraSlate would also be happy to arrange a volume order for a developer, once the design is finalized. On a related note, I'm not sure quite what AuraSlate means when they say that the source code is available. This is Android, so they already had a legal requirement to offer the source code. I suspect that AuraSlate is offering to go beyond the minimum legal requirements and offer the code for all of their work.